For those football fans who already scored free tickets via the NFL Draft lottery to be inside AT&T Stadium during the 2018 NFL Draft, kudos to you. 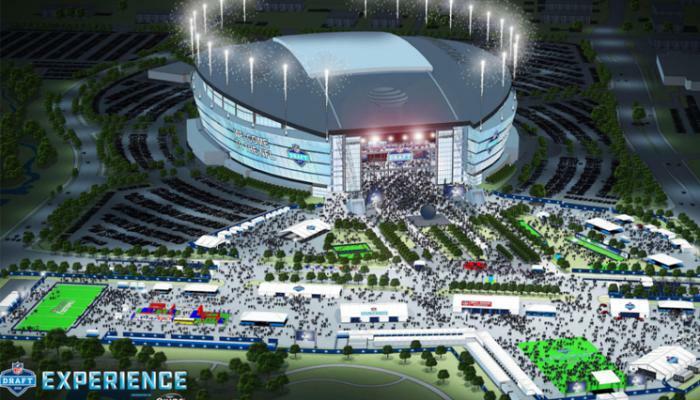 You’ll be among the lucky ones with seating inside the stadium during one of the three rounds of the NFL Draft! But for those of us who aren’t indoors, there are still lots of fun ways to be involved outside AT&T Stadium during all three days of the draft by visiting the NFL Draft Experience. All we have to do is visit NFL.com/FanMobilePass to sign up. Once you register on-line, your Fan Mobile Pass will be e-mailed to you. The personal scan code which the NFL will e-mail to you gives you exclusive access to NFL Draft Experience attractions. You will also have the chance to win standby tickets to go inside the stadium and be part of the audience in the NFL Draft Theatre. As for the outdoor NFL Draft Experience in Arlington, it will be located in the plazas and parking lots of AT&T Stadium. The 2018 NFL Draft Experience will be the largest free festival created by the NFL, spanning the size of 26 football fields. Autograph Stage: Get free autographs from current NFL players and NFL Legends. Vince Lombardi Trophy: take your photo with one of the five Cowboys Super Bowl trophies. NFL Museum: includes Hall of Fame memorabilia, bronze busts of Hall of Fame inductees, a full collection of 51 Super Bowl rings, the trophies for the AFC & NFC Championship games as well as the trophy awarded to the Walter Payton NFL Man of the Year. Get your own bronze bust digitized at the Pro Football Hall of Fame exhibit. College Football Corner: View College Football Hall of Fame memorabilia from former Round 1 Draft picks and Eagles legends, and cheer on Draft prospects from your favorite college team. Life size player mannequins offer unique photo opportunities. NFL Draft Experience Tailgate: Enjoy selections from some of Dallas&apos; best restaurants in a "taste of the town" tailgate. NFL Auction: Stop by the NFL Auction in the NFL Museum for giveaways and chances to win NFL instant prizes by checking in with your Fan Mobile Pass. View game worn and signed memorabilia available only on the NFL Auction website. NFL Helmet Photo Opportunity: As you enter NFL Draft Experience, find your favorite NFL team oversized helmet and have your photo taken by a Pepsi brand ambassador. Share your photos through your favorite social channel and Fan Mobile Pass. Gear Up & Go: Try on NFL equipment and feel what it&apos;s like to get dressed for gameday. Kids&apos; Extra Point Kick: Test your ability to kick a field goal through scaled down NFL uprights. Kids&apos; Long Snap: Test your ability to snap the ball like a pro. Kids&apos; Quarterback Challenge: Test your passing skills. Play Football Field: Watch and learn from USA Football coaches and play NFL FLAG football. On-field clinics are open to boys and girls ages 6-17. Daily clinics open on a first-come, first-served basis. Dates/hours are: Thursday 4/26, 12-9pm; Friday 4/27, 12pm-9pm; Saturday 4/28, 10am-4:30pm. If the above-listed activities and interactive experiences don’t convince you to come to Arlington for the NFL Draft Experience, maybe you’ll take advice from Dallas Cowboys Ring of Honor member Drew Pearson, the wide receiver who is one of the team’s most iconic former players. "For those who believed last year&apos;s NFL Draft created an amazing atmosphere, just wait until this year&apos;s event," Pearson told NFL.com. "From incredibly passionate Dallas Cowboys fans, to the largest free football festival in league history, the 2018 NFL Draft will be the biggest and best one yet. No doubt about it." Yes, Drew Pearson is the former Cowboy who punked Eagles’ fans during last year’s NFL Draft in Philadelphia. Pearson was asked by the NFL and the Cowboys to serve as a Community Ambassador for this year’s draft in Arlington. I can’t wait to see what he has in store for rival fans this spring! !